An Artist's Retreat for painters, writers and photographers with the objective to exploring your creative process with like-minded company. Both couples and singles are welcome. This Artist's Retreat is set in the most spectacular area of Andalucía, with it's vast range of subject matter from the monumental views of the Puente Nuevo bridge in Ronda to the beautiful Pueblos blancos and surrounding landscape. There are also many walks, (a treat for those interested in ornithology) interesting caves, boutique wineries and cultural places of interest to explore in and around Ronda, which is perfect for those wishing to bring their partners. Our accommodation is luxurious, beautiful bedrooms and bathrooms, a refreshing pool, an incredible kitchen and a cook to give us some mouth watering cuisine, with many different inside and outside nooks and spaces to work in. We can't think of any better way than to end a creative day with a dip in the pool, a glass or two of Spanish wine and tapas, over intelligent and interesting conversation. This is a rare opportunity and our places are strictly limited to 7 persons and as a consequence we advise anyone interested in attending the Artists Retreat to book early to avoid disappointment. We begin in Granada, walking through the magnificent Alhambra Palaces and Generalife. The sounds of swallows and trickling fountains sets the mood for contemplation of this beautiful World heritage site. Our day excursions include visiting Ronda, Arcos de la Frontera, Zahara and Vejer de la Frontera. Ronda is one of the most spectacular towns in Andalucía. Its secluded position in the Serrania de Ronda mountain range, built on a high plateau is breathtaking and beautiful. Walking around the old town will entice you with its many picturesque vistas and painting opportunities. The remarkable Pileta caves will take you back to the early roots of drawing. Then a visit to the antiquities of Casa del Obispo in Cadiz followed by a fabulous lunch at a cafe on the beach in Bologna, beside Bologna's incredible Roman ruins are experiences not to be missed. 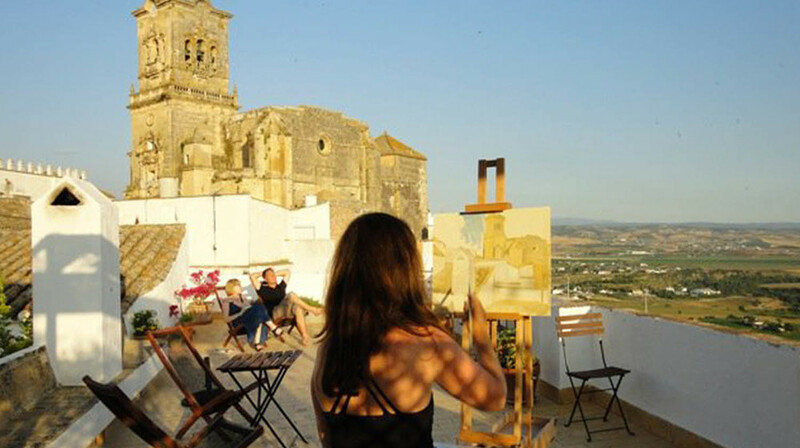 During our Artists Retreat in Andalucia, tuition is available on request. We send a list of recommended materials and an information sheet after you register. Easels and some drawing materials are provided. We also visit an art supply store in Spain at the start of our tour. If you have never painted from life then this Artist's Retreat will open a door that will amaze and delight you with a new found confidence. As professional painters and tutors with works in private collections around the world, both Grant and Alex enjoy sharing their extensive practical knowledge of painting and Art History. Grant Kenny studied painting in Madrid at the Circulo de Bellas Artes, painted in the Museo del Prado and the National Gallery in London. Grant has lived and travelled extensively throughout Spain and as a consequence knows Spanish Art and history very well. Fluent in Spanish he enthuses those who meet him with his passionate, entertaining and funny anecdotes. Alexandra also specialises in portraiture, and tutors privately. After a rewarding day of creativity relax and enjoy conversation over a glass of fino and olives. Take in the magnificent views accompanied by the sound of the nearby church bells. We enjoy authentic Andalucían cuisine taking our groups to some of the very best tapas bars and restaurants in the nearby villages of Arcos de la Frontera and Ronda ensuring our days always end with great food, wine and company. Self catering facilities are available for most of our Artists Retreat so there is choice to cook in or eat out, however we also have a great chef on hand and dinners together make a wonderful and memorable experience. During our Artists Retreat in Andalucia we stay in Ronda and travel to the surrounding Pueblos Blancos where we see amazing landscape and beautiful villages to draw inspiration from. Our accommodation is conducive to the creative process with a variety of spaces for each person to paint, write and create. It's each person's choice as to where they work whether out on location or back in privacy at our accommodation. We find that the region of Andalucia is so inspiring, filling our thirst for creative inspiration for many months after we arrive home.